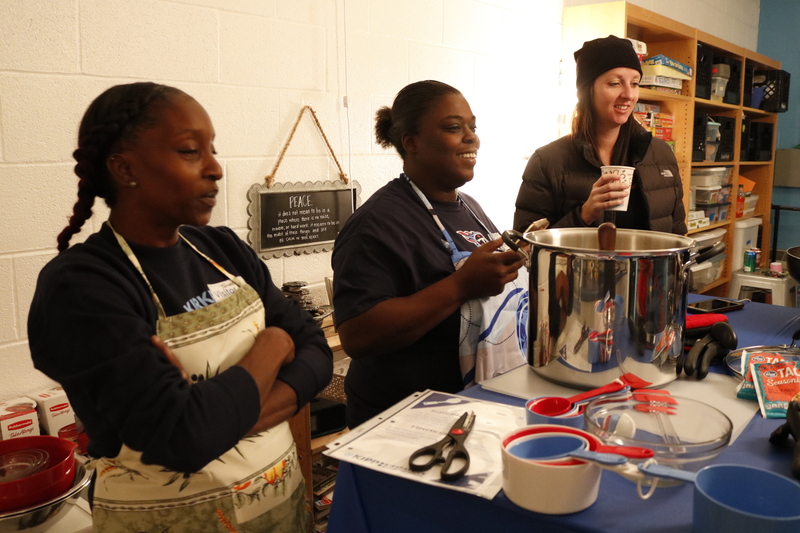 If you happen to walk down the second grade hallway at KIPP Kirkpatrick Elementary School on the right Friday, your noise will catch a mouth-watering scent of chicken noodle soup or chili. Instead of her regular space, Elizabeth White’s office is transformed into a test kitchen and cooking class for the school’s families. White and cooking instructor, Betsy Fisher, busy themselves handing out aprons and prepping each of the workstations with all the necessary ingredients and recipes needed for the day’s meals. “It makes me feel connected to the school and to other parents,” explains Tonette Fletcher, who has three children at KIPP Kirkpatrick. Fisher, who has been a long-time volunteer at the school, is a self-taught cook who loves sharing her knowledge with others. 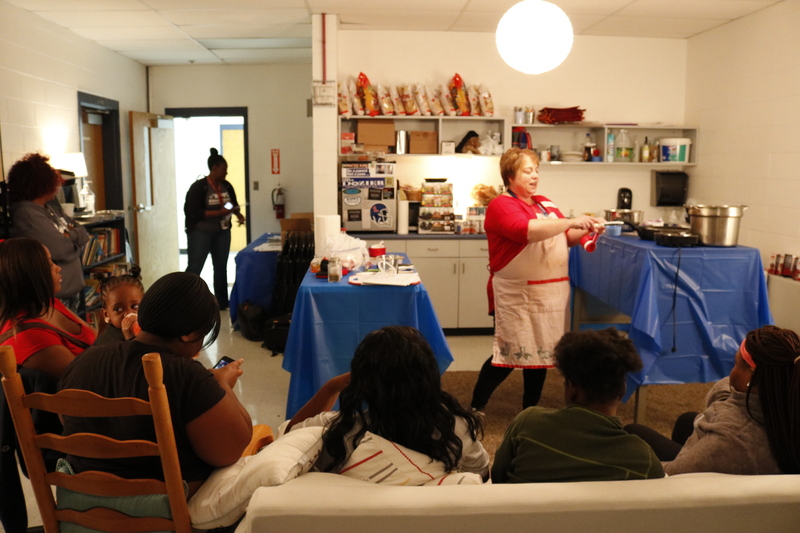 For Fisher, the class is about nurturing a love of cooking in others, as well as helping families become more comfortable in the kitchen so they might be more inclined to cook at home. Once Fisher does her mini lesson at the beginning of class and goes over the cooking skills needed to execute the meals they will be working on, the parents split into three groups and each make a different recipe together. The class helps families build relationships with each other, as well as the school, but there are also long-term benefits White hopes come out of it. 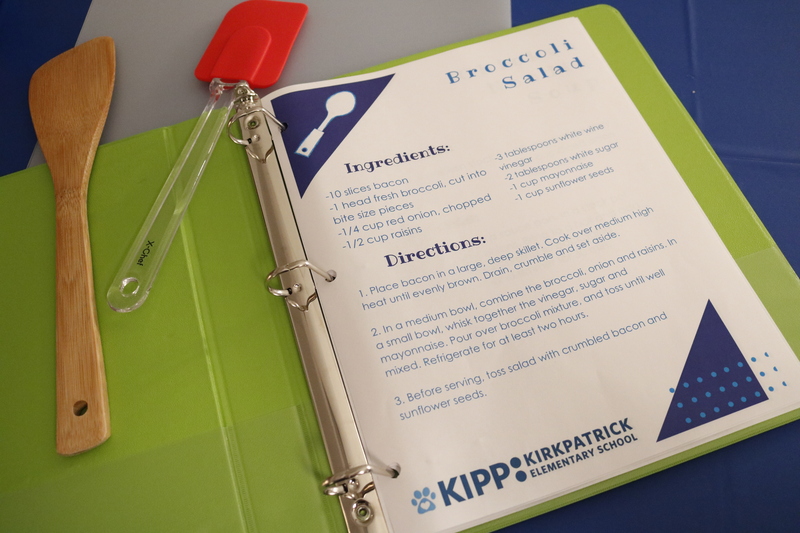 The cooking class is made possible through a grant from a KIPP Kirkpatrick community partner, Christ Presbyterian Church. Of course, after all the hard work is done and the food is ready to eat, the class gets to enjoy the fruits of their labor by sitting down and sharing a meal together. Any leftovers are sent home with the families, along with a recipe binder that is added to each month. With love, from the Kitchen of KIPP Kirkpatrick Elementary School.